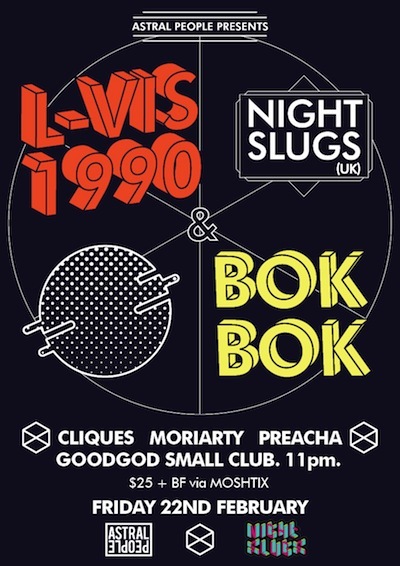 After an extensive wait and countless requests, Sydney’s Astral People are proud to present one of the most anticipated tours of the year, as NIGHT SLUGS (L-Vis 1990 & Bok Bok) hit the Danceteria on their first Australian tour. The Night Slugs name first came into existence in early 2008 when, inspired by a variety of experimental club music from around the globe, the duo linked up to start a club night dedicated to a brand new hybrid sound. This new aesthetic fused international gutter house styles with London’s unique soundsystem heritage, with an emphasis on innovation, breaking new producers, debuting fresh tracks, uncompromising bass weight and above all, a functionalist dancefloor-friendly vibe. The Night Slugs record label has also remained at the forefront of innovative and progressive electronic music to which all others are compared. Responsible for some of the biggest club releases of the last three years (whilst debuting the artists responsible), the Night Slugs sound has become synonymous with trends for the months following. Touring Australia together for the first time, L-Vis 1990 & Bok Bok will be repping Night Slugs in full, playing the legendary back to back sets that have taken them from UK radio staple RinseFM to festival and support slots throughout the biggest events in the world. The system will be ready.